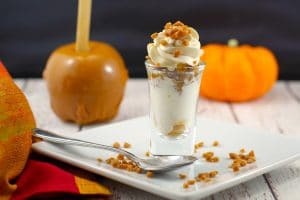 I’m a huge fan of dessert shots! 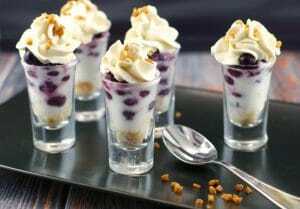 I really like that this mini dessert recipe in shot glasses is small so you can indulge without the guilt. They are miniature, cute, no bake and can be made in 15 minutes. And best of all they have Baileys Irish Cream in them (or use Irish Cream extract if you want to avoid the alcohol) AND chocolate in the form of 2 bite brownies. 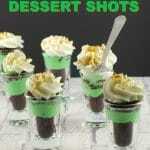 It’s fun to make holiday themed food, especially St. Paddy’s Day green desserts with irish cream! 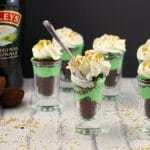 But easy green dessert recipe ideas are not always easy to come by and that’s exactly why I created these St. Patrick’s day Irish Cream Dessert Shooters! Just be mindful of who you feed it to if you decide to use alcohol. 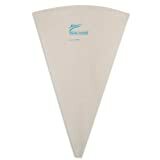 A recent blunder taught me that you need to be particularly cognizant of who you’re cooking for. You may or may not want to feed this dessert to your kids. I do and am not concerned, as there is a scant amount of alcohol in it (1.5 tbsp for 12 dessert shots). But without even thinking, I recently brought my boozy kahlua and caffeine infused No Bake Black Forest Tiramisu dessert to a family BBQ potluck for my kids’ dance school back in the fall. Doh! My kids are my testers so they try pretty much everything I make. 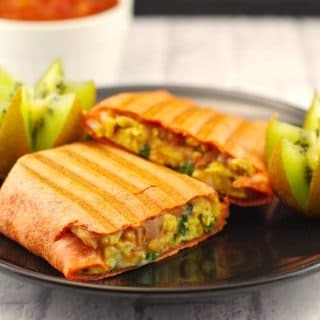 They would be pretty upset if they didn’t get to test a recipe, especially a delicious dessert. But my daughter did ask, “I am going to get drunk?” She’s 10. I assured her that wouldn’t happen. Luckily before I arrived at the family BBQ I remembered that I’d be feeding my alcohol and caffeine spiked dessert to a group of kids and stuck up a sign warning parents that it contained these ingredients. Although the amount of alcohol or caffeine wasn’t a concern to me (I’d feed it to my kids), there are parents out there that may not appreciate finding out about that after the fact. Fortunately no one at this particular family function appeared phased by it (at least that I could see) so that was a relief. But there are many family friendly events I could reflect back on where I’d probably be lynched with that move. More often than not, I’m cooking with my blog in mind, as I’m trying to fit my recipe posts into my real life. 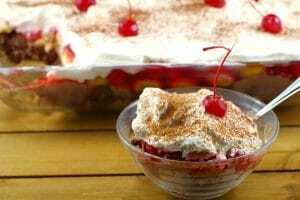 I needed to photograph my Black Forest Tiramisu recipe again, as my old one was hideous and since it makes a great potluck dessert, I decided to do it then. But I learned that more importantly, you need to cook for your crowd! 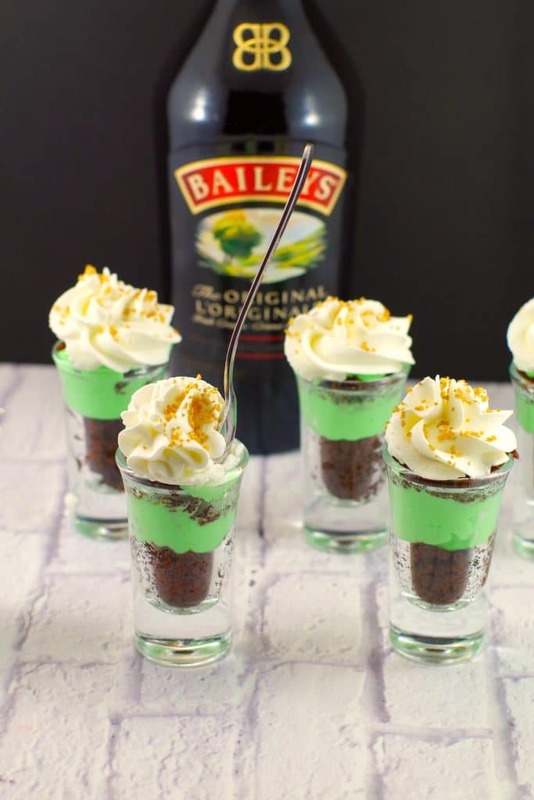 But rest assured, these shot glass desserts, made with Baileys alcohol (or irish cream extract) will definitely please any crowd, with or without the alcohol! They are the ultimate St. Patrick’ day treat. 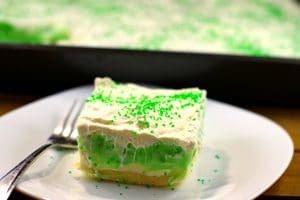 So, if you are looking for a Baileys Irish cream recipe and/or green dessert ideas, this is your easy and green St. Patrick’s Day dessert. 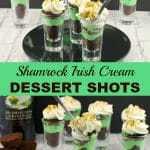 These Shamrock Irish Cream Dessert Shots can be made in 15 minutes, with or without alcohol and are the perfect fast and easy green dessert for St. Patrick's Day. 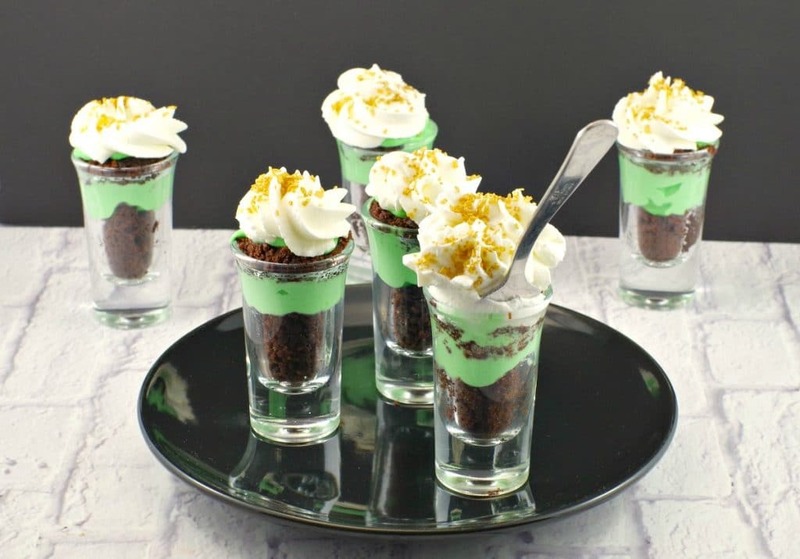 The mini desserts are made with 2 bite brownies, pudding and Baileys Irish cream, but you can indulge guilt-free because they are miniature! Whip the whipping cream to soft peaks with hand mixer. Set aside about 1/2 of the whipping cream, then add Bailey's Irish Cream to the other half and whip to stiff peaks. Fold whipped cream/irish cream mixture into pudding and add food/icing colouring. With remaining whipped cream (that will be your garnish) add 1 white granulated sugar and whip to stiff peaks. Set aside for garnish. 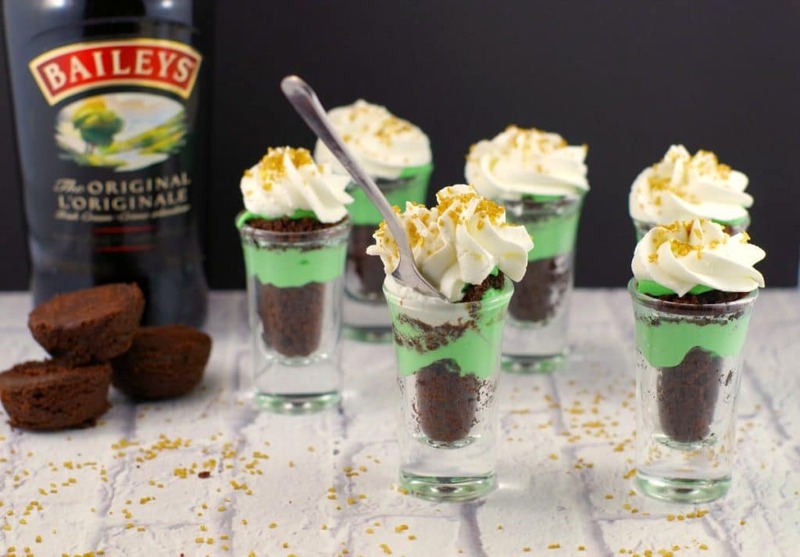 Cut each 2 bite brownie in half and take bottom 1/2 of brownie and press into bottom of shot glass, then add a little Shamrock pudding. 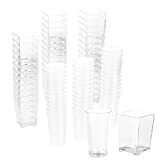 Repeat for all 12, dividing it equally by remainder of shot glasses. ** Just make sure you leave enough space to add the other half of the brownie. You are so brilliant Terri, I love this idea. This is a lot of effort for me to put them in shot glasses, do you think it would work well as a trifle? And I might use spinach powder to colour it green ; ). I can let you know how that goes…. Just curious…a small box of jello pudding mix is 96 grams, or 3.4 oz. 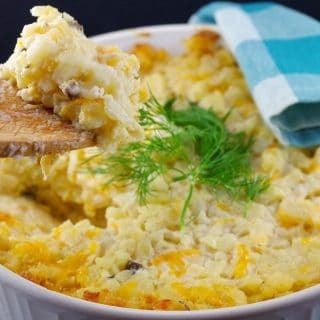 How much do you use for the recipe, and does it have to be fat free? Thank you! Yes, I’m in Colorado. Hope it turns out!